I’ve been reading a lot of story-driven fiction lately, including a lot of young adult books like Divergent and things like Doctor Sleep by Stephen King. 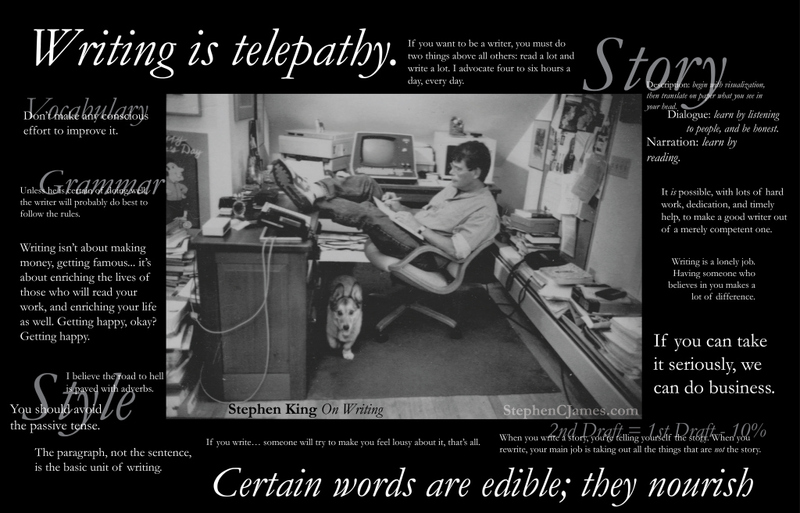 This prompted me to delve into King’s On Writing, in which he explains that good stories start from concepts, not plots. When I first started writing fiction, I generally started with an idea or feeling I wanted to express, not with stories or characters or anything even remotely interesting to readers. As I evolved a bit, I read Story by Robert McKee and learned the value of plotting out engaging stories with notecards and developing interesting characters using Dungeons-and-Dragons-style character record sheets. This is a laborious approach, but it helped me to refocus my writing. However, it makes for a slow process, and I had to put a my pots on simmer rather than boil while starting a family and enrolling in grad school. “I won’t try to convince you that I’ve never plotted any more than I’d try to convince you that I’ve never told a lie, but I do both as infrequently as possible. I distrust plot for two reasons: first, because our lives are largely plotless, even when you add in all our reasonable precautions and careful planning; and second, because I believe plotting and the spontaneity of real creation aren’t compatible. It’s best that I be as clear about this as I can—I want you to understand that my basic belief about the making of stories is that they pretty much make themselves” (163). Anyhow, I have some concepts I’ve been kicking around—some more complete than others. I hope to share a few elevator pitches with you. I even started plotting some of them out, but maybe I’ll change tack. What do you think? Do you write with an outline, or do you go with the flow? I think you need to do some form of planning just so you know what you want your story to accomplish. I have trouble actually planning out an entire outline though, I find it hard to be creative in the planning stage. I wrote a novel with no planning, and, consequently, there’s no plot. I wrote a screenplay that was completely mapped out, and, consequently, there’s no emotion. So, I agree. Middle ground is needed! My first novel I just went with the flow, but after knowing how hard it was to revise now that I’m working on a new project I’m putting a lot more time into an outline. Great post! Yeah, I’m not sure how to approach my next attempts at fiction. Thanks for the perspective!